I have made the following updates to the list of nominees and nomination candidates planning to run in Alberta’s next provincial election. Please email david.cournoyer [at] gmail.com if you have additions to the list. Thank you. Bonnyville-Cold Lake: City of Cold Lake Mayor Craig Copeland is seeking the Progressive Conservative nomination to replace retiring MLA Genia Leskiw. Update: The Bonnyville Nouvelle reports that former Wildrose nomination candidate Dixie Dahlstedt is now seeking the PC nomination. Calgary-Bow: Troy Millington announced on Twitter that he will seek the Alberta Party nomination. 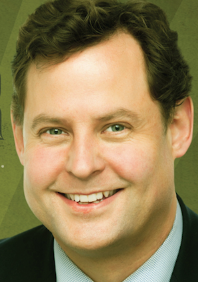 Mr. Millington was the Alberta Party candidate in the 2014 Calgary-West by-election. Calgary-Cross: Alyx Nanji has now declared his intentions to seek the PC nomination in this east Calgary constituency (he initially announced he would seek the PC nomination in Calgary-Bow). Mr. Nanji is a former staffer to PC MLA Ted Morton and recently completed a degree at the University of Saskatchewan College of Law. Also in Calgary-Cross, Ricardo Miranda will seek the New Democratic Party nomination scheduled for Feb. 21, 2015. Calgary-Currie: Former political staffer Dustin Franks is challenging first-term MLA Christine Cusanelli for the PC nomination. Mr. Franks previously worked for former Member of Parliament Lee Richardson and MLA Donna Kennedy-Glans. Brian Malkinson will seek the NDP nomination. Mr. Malkinson previously ran for the NDP in the Sept. 2014 Calgary-West by-election. Calgary-Fish Creek: Three candidates have announced plans to seek the PC nomination in this south Calgary constituency: Richard Gotfried, lawyer Byron Nelson and Brad Robson. 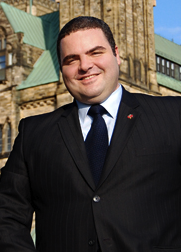 Calgary-Lougheed: Mihai Ion is seeking the NDP nomination scheduled for Feb 21, 2015. 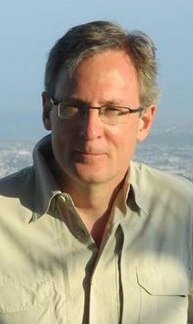 Calgary-Shaw: Graham Sucha is seeking the NDP nomination scheduled for Feb 21, 2015. Cardston-Taber-Warner: Municipal District of Taber Reeve Brian Brewin is challenging Wildrose-turned-PC MLA Gary Bikman for the PC nomination. Mr. Brewin was first elected to Taber municipal council in 1998 and has been endorsed by Brooks Mayor Martin Shields (nominated federal Conservative candidate in Bow River) and former PC MLA Bob Bogle. 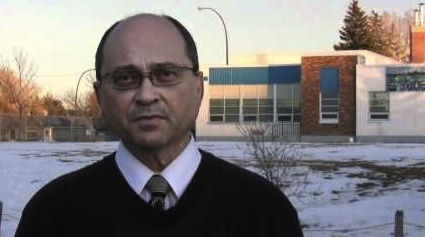 Former MLA Paul Hinman is said to be considering a run for the Wildrose nomination. Mr. Hinman was the MLA for this constituency from 2004 to 2008 and Calgary-Glenmore from 2009 to 2012. Chestermere-Rockyview: The Calgary Herald reports that Wildrose-turned-PC MLA Bruce McAllister has declared he will seek the PC nomination. Edmonton-Calder: NDP MLA David Eggen will seek his party’s nomination for re-election on Feb. 22, 2015. Mr. Eggen is currently serving his second term as MLA. 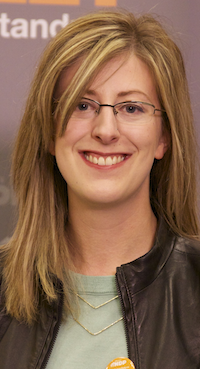 Edmonton-McClung: Public affairs consultant and PC party activist Amanda Nielsen is seeking the PC nomination. Lacombe-Ponoka: Former Town of Ponoka Mayor Larry Henkleman is challenging Wildrose-turned-PC MLA Rod Fox and Peter Dewit for the PC nomination. Strathmore-Brooks: Former Canadian Taxpayers Federation lobbyist Derek Fildebrandt announced this week that he will run for the Wildrose Party in this southern rural constituency. Last year, Mr. Fildebrandt was rumoured to be eyeing the Wildrose nomination in Calgary-Bow. The constituency is currently represented by MLA Jason Hale, a former Wildrose MLA who crossed the floor to the Progressive Conservatives in December 2014. Update: Update: The Brooks Bulletin reports that County of Newell Reeve Molly Douglass will challenge Mr. Hale for the PC nomination. Whitecourt-Ste. Anne: Oniel Carlier is seeking the NDP nomination scheduled for Feb 27, 2015. Carlier is a Regional Representative at Public Service Alliance of Canada. This entry was posted in Alberta Politics and tagged Alyx Nanji, Bob Bogle, Bonnyville-Cold Lake, Brad Robson, Brian Brewin, Brian Malkinson, Bruce McAllister, Byron Nelson, Calgary-Bow, Calgary-Cross, Calgary-Currie, Calgary-Fish Creek, Calgary-Lougheed, Calgary-Shaw, Cardston-Taber-Warner, Chestermere-Rockyview, Craig Copeland, David Eggen, Derek Fildebrandt, Dixie Dahlstedt, Donna Kennedy-Glans, Dustin Franks, Edmonton-Calder, Edmonton-McClung, Gary Bikman, Genia Leskiw, Graham Sucha, Jason Hale, Lacombe-Ponoka, Larry Henkleman, Lee Richardson, Martin Shields, Mihai Ion, Molly Douglass, Oniel Carlier, Paul Hinman, Ricardo Miranda, Richard Gotfried, Strathmore-Brooks, Ted Morton, Troy Millington, Whitecourt-Ste. Anne on January 28, 2015 by Dave Cournoyer. Calgary-Buffalo MLA Kent Hehr (right) with nominated Calgary-Confederation Liberal candidate Matt Grant. Political Calgary is abuzz with rumours that popular MLA Kent Hehr will seek the Liberal nomination in the federal riding of Calgary-Centre. Reliable sources say that Mr. Hehr has gone so far as to request nomination forms to become an official nomination candidate for the federal Liberals. Mr. Hehr would be a star candidate for the Justin Trudeau-led Liberals in Alberta, who see an opportunity to unseat Conservative Member of Parliament Joan Crockatt in the next election. 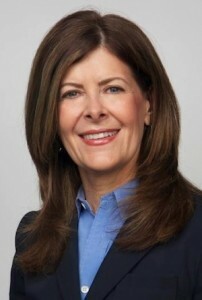 Ms. Crockatt placed a narrow 1,158 votes ahead of Liberal challenger Harvey Locke in a November 2012 by-election. That by-election took place one year after former Conservative MP Lee Richardson defeated his closest challenger with a 19,770 vote margin of victory in the 2011 federal election. A well-respected lawyer before he entered politics, the likeable Mr. Hehr has represented the downtown Calgary-Buffalo constituency as a Liberal since the 2008 election. The Liberal Finance and Energy critic briefly ran for mayor in 2010, bowing out and endorsing Naheed Nenshi before nomination day. Mr. Nenshi’s campaign manager in that election and now his chief of staff Chima Nkemdirim also managed Mr. Hehr’s first election campaign in 2008 (Mr. Nkemdirim has also has been rumoured as a potential Liberal candidate in the same riding). In December 2012, Mr. Hehr stirred up some controversy within his party when he wrote a guest post on this blog suggesting that the narrow Conservative win in the Calgary-Centre by-election should send a wake up call to Liberals, NDP and Greens in this province. As an MLA, Mr. Hehr has been a thorough opposition critic and a champion of LGBTQ issues, introducing Motion 503 supporting Gay-Straight Alliances in Alberta schools (the motion was voted down by a coalition of 22 Progressive Conservative and 9 Wildrose MLAs). 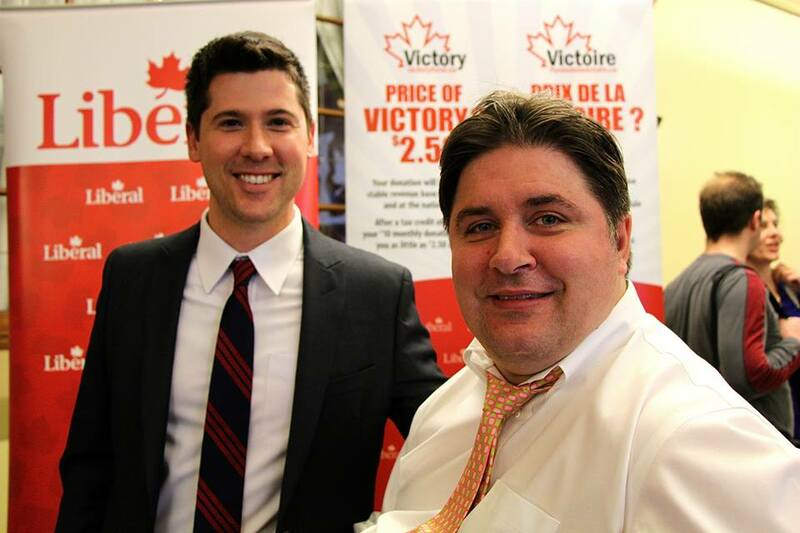 Perhaps trying to appeal to a more conservative base of supporters, Mr. Hehr was pictured alongside Wildrose MLA Rob Anderson this week signing a “no-debt” pledge from the Tea Party-lite Canadian Taxpayers Federation. He would not be the only Liberal MLA planning to jump into federal politics in the next election. 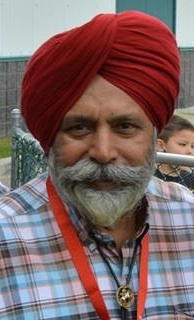 Calgary-McCall MLA Darshan Kang was recently nominated as the federal Liberal candidate in the north east Calgary’s new Calgary-Skyview riding. If both Liberal MLAs are nominated, they would each be required to resign as MLAs when a federal election is called, leaving the Liberals with only three MLAs in the Assembly (and for the first time since before the 1993 election, with less MLAs than the New Democratic Party, which currently has four MLAs). Other MLAs running for federal nominations are Edmonton-McClung PC MLA David Xiao, who is seeking the federal Conservative nomination in the new Edmonton-West riding, and Independent Calgary-Foothills MLA Len Webber, who is running for the Conservative nomination in the new Calgary-Confederation riding. Attempts were made to contact Mr. Hehr in order to confirm and comment on the rumours of his potential candidacy in Calgary-Centre. No response had been received at the time this post was published. UPDATE (July 17, 2014): As predicted in this post, Calgary-Buffalo MLA Kent Hehr has announced he will run for the federal Liberal nomination in Calgary-Centre. This entry was posted in Alberta Politics and tagged Calgary-Buffalo, Calgary-Centre, Calgary-Centre by-election, Calgary-Confederation, Calgary-Foothills, Calgary-McCall, Calgary-Skyview, Canadian Taxpayers Federation, Chima Nkemdirim, Darshan Kang, David Xiao, Edmonton-McClung, Edmonton-West, Gay-Straight Alliances, Harvey Locke, Joan Crockatt, Kent Hehr, Lee Richardson, Len Webber, Matt Grant, Motion 503, Naheed Nenshi, Rob Anderson, Tea Party on July 16, 2014 by Dave Cournoyer. Alberta politics takes a negative turn online. An image released online by the Premier’s Communications Office. MLA pay remains an uncomfortable issue for Alberta’s political leaders. Yesterday, MLA’s sitting on the Member Services Committee voted to freeze the annual cost-of-living increase to their salary and housing allowance ahead of provincial budget release on March 7, 2013. “The rationale is clearly we want to lead by example,” Edmonton-Riverview Tory MLA Steve Young told the Edmonton Journal. The decision to freeze MLA pay happens as rhetoric about politician and doctor pay has reached an all-time high (though the conflict is really about control). 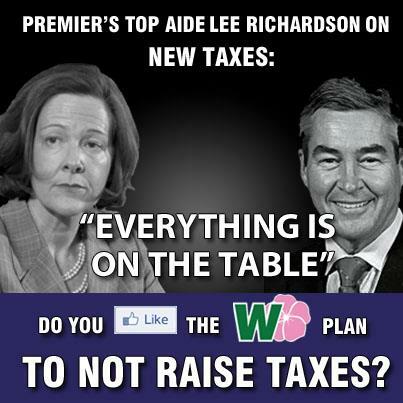 A Wildrose image picturing Premier Alison Redford in a less than flattering light. Yesterday’s pay vote also resulted in more online mudslinging on Twitter’s #ableg hashtag, though this time from an unexpected source. 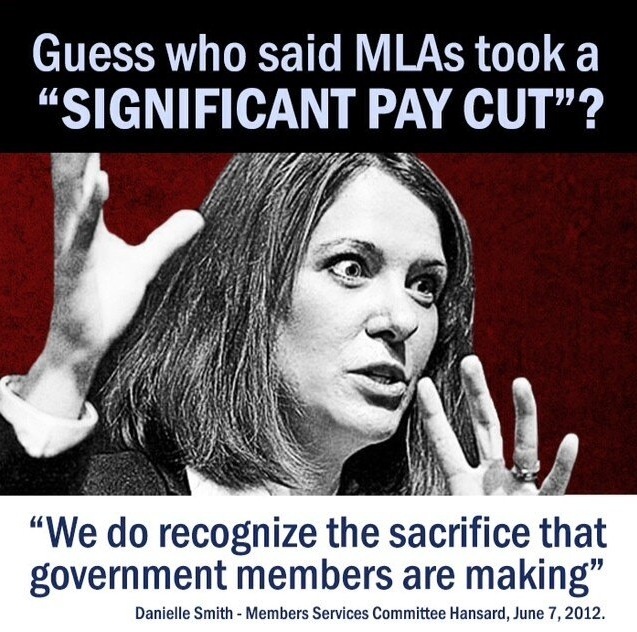 The Twitter account operated by Premier Alison Redford‘s Communications Staff – @ABPremierComms – tweeted an image featuring an incredibly unflattering photo of Wildrose leader Danielle Smith with a quote she made at a meeting on June 7, 2012 (see image at the top of this post). While distasteful, the reaction from the Premier’s Office is not unprovoked. Over the past year, the official opposition Wildrose Caucus has released numerous images and info-graphics on Twitter and Facebook filled with harsh criticisms and unflattering photos of Premier Redford. The harsh negative politics and aggressive use of images and info-graphics has helped the Wildrose Party cultivate a significant online following, who have helped spread their message through social media. This entry was posted in Alberta Politics and tagged Alison Redford, Danielle Smith, Lee Richardson, Steve Young on February 8, 2013 by Dave Cournoyer. Big turnover in Premier’s communications office. After staff departures, former Ontario-based political operatives hold two top roles in Alberta Premier’s Office. Last week it was announced that Jay O’Neill is departing his job as Director Communications under Premier Alison Redford‘s. Although Mr. O’Neill only joined the Premier’s office in late 2011, it is not uncommon for individuals to only fill these types positions for a short period of time. The Tories were hit with a handful of embarrassing scandals in the closing months of 2012 and were caught unprepared, having to spend the fall sitting of the Assembly playing defence against an aggressive Wildrose Party opposition. The Spring sitting of the Assembly will begin on March 5, 2013. Four other staff left or announced their departures from Premier Redford’s communications office over the past few months, perhaps a result of internal pressure to change direction and take a more aggressive approach towards political communications in 2013. Tammy Forbes left her job as the Premier’s Communications Liaison Manager to become Chief of Staff to embattled Tourism Parks and Recreation Minister Christine Cusanelli. Minister Cusanelli faced harsh criticism before the Christmas break when she was forced to repay the government $10,600 for expenses racked up in her first five months in office, including a $4,000 airfare charge to have her daughter and mother fly with her to the 2012 Summer Olympics in London, United Kingdom. Before joining the Premier’s office in 2011, Ms. Forbes was director of communications in the Department of Transportation. Two other departing staff have jumped from their political jobs to roles in the public service. Tracy Balash has left the Premier’s Communications Office to become the Executive Director of Communications Planning in the Public Affairs Bureau (PAB). As noted in a recent Globe & Mail article, the PAB is in a period of transition after the retirement of Kathy Lazowski, its executive director of strategic communications. The Premier’s Issues Manager Nikki Booth is now the Acting Issues Manager (Communications) in the Department of Environment and Sustainable Resource Development. Kim Misik, the Premier’s press secretary, also announced that she will be leaving her position. Social Media Manager Mike Jenkinson remains the longest serving member of the Premier’s team, having started in the office during Ed Stelmach‘s premiership. The new Director of Communications is Stefan Baranski, who joined the Premier’s office as Director of Strategic Communications in September 2012 after leaving his job with the Toronto-based Counsel Public Affairs firm. In Ontario, he served as senior advisor to PC Party leaders Tim Hudak and John Tory, and Premier Ernie Eves. Mr. Baranski is not the only former Ontario-based political operative in the Premier’s office. While originally from Alberta, Director of Operations Darren Cunningham is a veteran of Ottawa’s political scene, having served in Chief of Staff and communications roles for Prime Minister Stephen Harper and various Conservative cabinet ministers. He started working for the Premier’s office in June 2012. Another Ottawa insider, Lee Richardson left his job as a Member of Parliament to become the Premier’s Principal Secretary in May 2012. It is suspected that not all of these vacant positions in the Communications office will be filled. Some sources suggest that the Premier’s office may increase their reliance on consultants from outside political and communications companies to fill the gap. This entry was posted in Alberta Politics and tagged Alison Redford, Christine Cusanelli, Darren Cunningham, Jay O'Neill, Kathy Lazowski, Kim Misik, Lee Richardson, Nikki Booth, Stefan Baranski, Stephen Harper, Tammy Forbes, Tracy Balash on January 16, 2013 by Dave Cournoyer. 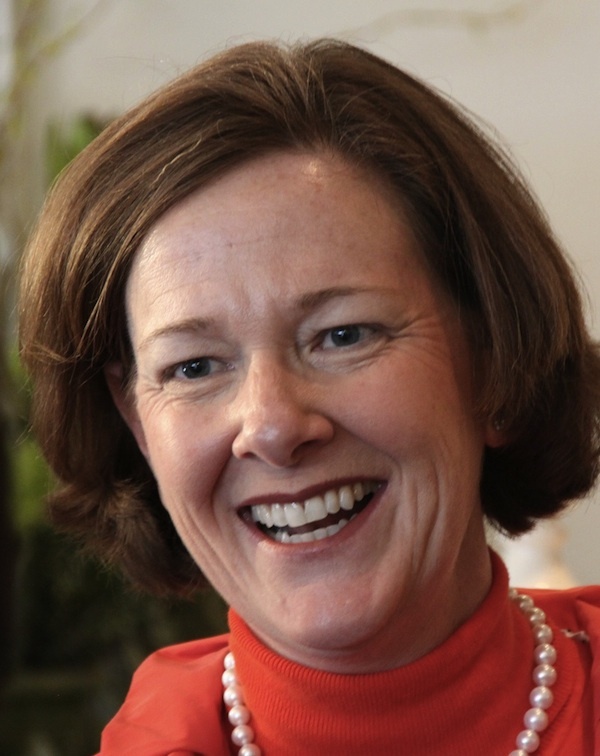 Alison Redford’s revenue problem will define 2013 budget fight. The low price of oil and natural gas and an election promise of “no new taxes, no service cuts” has put Alberta’s Tories in an unenviable political bind and set the tone for this year’s provincial budget debate. This week, Lee Richardson, Principal Secretary to Premier Alison Redford, released a trial balloon suggesting the government is looking at all revenue options, including tax increases, to fund the provincial operating budget. On the capital side of the provincial budget, Premier Redford and Finance Minister Doug Horner have talked about taking an adult approach to long-term financing of capital projects and maintenance of public infrastructure. After decades of aggressive messaging and lobbying from interest groups like Americans for Tax Reform in the United States and its the Canadian Taxpayers Federation and the Fraser Institute in Canada, our political culture has been shaped to include a gag reflex to the concept of increasing tax revenue. The averse public reactions to tax increases are inevitable and is also strengthened with the increasingly prominent belief that government is inefficient and wasting public funds. This perception has essentially robbed government of its ability to increase its most easily accessible and more reliable source of revenue. Alberta currently has some of the lowest tax rates in Canada. Alberta’s corporate tax rates have remained low even as profits of corporations in the province have climbed more than 300%. We could afford to raise corporate taxes and remain the most competitive jurisdiction in Canada. In the recent provincial election, the Tories pledged they would not raise taxes, Danielle Smith‘s Wildrose are ideologically inclined to cut taxes (and cut services), and Raj Sherman‘s Liberalbertans have differentiated themselves by calling for increased taxes. Brian Mason‘s New Democrats largely shied away from tax talk, but remained steadfast that natural resources revenues should increase (in Norway, a $600 billion oil fund was created from resource revenues collected and invested by the government). If you asked most Albertans whether they would support cuts to essential services like health care, education, and public infrastructure maintenance, most would overwhelmingly disagree with the cuts. Alberta is just beginning to recover from the decade-long turmoil caused by short-sighted budget cuts and public sector layoffs made by Premier Ralph Klein‘s government in the mid-1990s. Albertans have a strong economy and good quality of life that is boosted by strong government programs that improve our health, education, and community services. With a growing population and a booming economy, long-term planning and stable funding, not cuts to government services, are critical to preserving and increasing our quality of life. Worth listening to: A recent recording of the popular This American Life radio show highlighted the debate and some of the affects that “austerity policies” have had south of the border. As noted in yesterday’s post, Premier Redford’s Director of Communications, Jay O’Neill, announced that he will be leaving his position at the Legislature. Stefan Baranski, a communications adviser to the Premier and formerly an Ontario-based consultant, will serve as the new Director of Communications. This entry was posted in Alberta Politics and tagged Alison Redford, Brian Mason, Danielle Smith, Doug Horner, Jay O'Neill, Lee Richardson, Raj Sherman, Stefan Baranski on January 11, 2013 by Dave Cournoyer. Right-wing Sun News tries to rescue Conservative fortunes in Calgary-Centre. There is no one who can get angry conservatives worked up in this province like a Trudeau. Mr. Trudeau is on a leadership tour through British Columbia and Alberta this week, having campaigned with Liberal by-election candidate Harvey Locke in Calgary-Centre and rallying a crowd of more than 400 party faithful in downtown Edmonton. Following Liberal MP David McGuinty‘s comments earlier this week, the release of Sun News’ “breaking exclusive” of Mr. Trudeau’s two year-old anti-Alberta comments is miraculously well-timed for the Conservatives. It feels as if the Conservative campaign in Calgary-Centre got exactly what it was asking for. Polling since August has shown Mr. Locke in second place and Green Chris Turner gaining momentum in Calgary-Centre. Over the course of the campaign, Ms. Crockatt’s has opted to avoid numerous public all-candidate forums in favour of canvassing doors. Interestingly, the campaign found time in its busy schedule yesterday to stop by Sun News studios in Calgary to denounce Mr. Guinty’s comments on a talk show hosted by vicious right-winger Ezra Levant. 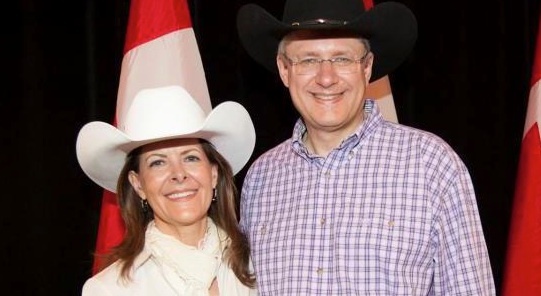 Ms. Crockatt’s sudden appearance on the right-wing talk show has everything to do with her campaign’s slip in the polls, which is seen by many to be a result of her campaign’s connections to the right-wing Wildrose Party. It should be noted that the connections between Sun News, the federal Conservative Party, and the Wildrose Party are deep. Sun News has been nothing short of a cheerleader for both the opposition Wildrose Party in Alberta and Conservatives in Ottawa. Even staff appear to be interchangeable. Candice Malcolm, the current Director of Research for Sun News is the former executive assistant to Wildrose leader Danielle Smith and spokesperson for Conservative politician Jason Kenney. 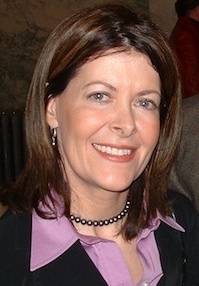 The strong connections between the federal Conservatives and the Wildrose Party is suspected to have driven away many moderate conservatives, who support Alison Redford‘s governing Progressive Conservatives and see the by-election campaign as too closely associated with the hard right-wing provincial party (including campaign manager, William McBeath, is also on staff with the Wildrose Party). These connections are believe to have contributed to near evaporation of the 40% margin of victory that former MP Lee Richardson earned in the 2011 election. Threehundredeight.com analyst Eric Grenier has looked beyond the politics and has analyzed the numbers, and his a recent post, he suggests that more disenchanted Conservative voters are shifting to the Greens, rather than the Liberals. This movement of Tories to the Greens in Calgary-Centre seems to be supported by Donal O’Beirne, the former president of the Conservative association in Calgary-North East, who has endorsed Mr. Turner, and the launch of a new Facebook Group, “Progressive Conservatives 4 Turner“, which sprung up this week. One senior provincial Tory suggested to me this week that the Wildrose Party now “controls almost the entire federal Conservative Party in Alberta,” suggesting that the split between the provincial and federal Tory parties will be very difficult to mend. If the Conservatives are not able to win the riding on the November 26 vote, or even if the results are close, the by-election should be a warning to the Ottawa Tories that their support of the Wildrose Party could cause moderate Albertans to park their votes elsewhere. A new poll was released by Return on Insight today. The poll shows Mr. Crockatt with 37% to 32% for Mr. Locke and 17% for Mr. Turner. While I am naturally skeptical of all polls, I am immediately skeptical of this poll due to ROI owner Bruce Cameron‘s close connections to the Liberal campaign in Calgary-Centre (watch this video from October 21, 2012, where Mr. Locke talks about the work Mr. Cameron is doing for his campaign). This entry was posted in Alberta Politics and tagged Alison Redford, Candice Malcolm, Chris Turner, Danielle Smith, David McGuinty, Donal O'Beirne, Eric Grenier, Ezra Levant, Harvey Locke, Jason Kenney, Joan Crockatt, Justin Trudeau, Lee Richardson, William McBeath on November 23, 2012 by Dave Cournoyer. Guest Post: Yes, Calgary-Centre Can Elect a Progressive MP. Like anyone who arrived in Calgary Centre after 1968, I’ve never witnessed a Liberal, NDP or Green candidate win an election. It’s understandable that some progressives feel that their vote does not count. 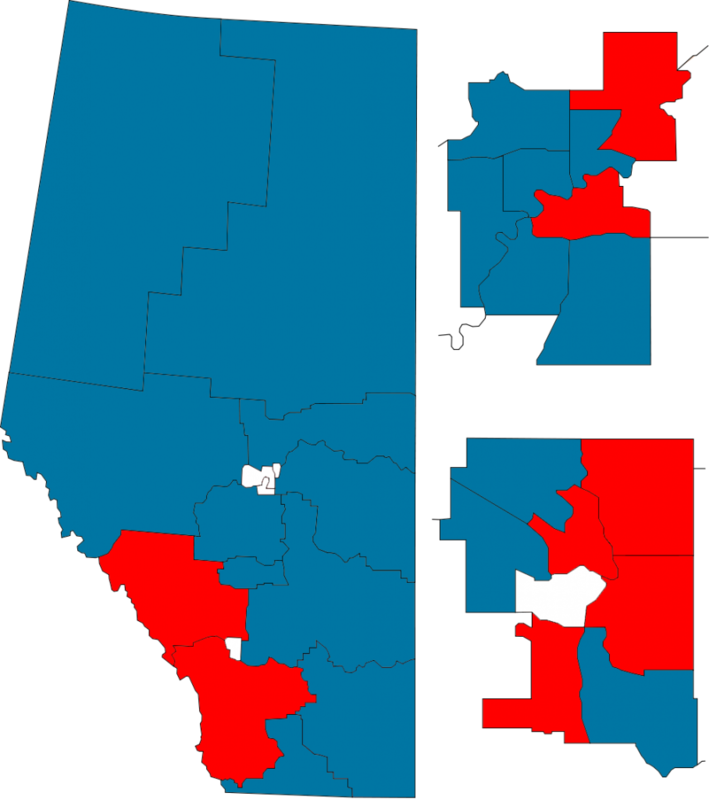 Over the past four decades, progressive and conservative parties have each earned significant support in Calgary Centre (with usually around a 45% to 55% split respectively). The multiplicity of progressive parties has ensured a Conservative Party of Canada victory in recent elections. Some progressives were happy with our former MP, Lee Richardson, who was generally regarded as a moderate voice in Government. Then along came Joan Crockatt. She is the Conservative candidate in the Calgary Centre who is reportedly “an avid cheerleader for the Wildrose Party” and who has said the role of a backbench MP is to “support the Prime Minister in whatever way that he thinks”. In spite of the history, the communities that make up Calgary Centre have proven the ability to defy expectations and elect progressive candidates. In 2000, progressives united behind the Right Honourable Joe Clark, a former Prime Minister and who was generally regarded as the consensus progressive candidate, to oust the incumbent Reform MP Eric Lowther. Liberal Kent Hehr was recently re-elected as MLA by many Calgary Centre residents. In 2010, a majority of Calgary Centre residents voted for Naheed Nenshi for Mayor—and there were 15 candidates on the ballot! Can progressives do it again in Calgary Centre? 1CalgaryCentre is an independent progressive campaign that was launched this summer by a group of volunteers. Our idea is pretty simple: engage progressives in a dialogue in the months before the by-election and then hold a vote to select a consensus progressive candidate. We use the term progressive broadly, including the centre-left parties, progressive conservatives, independents and post-partisans. The parties (and voters) would in no way be bound by the 1CalgaryCentre vote. Rather, our goal is to send a clear signal to progressive voters about the relative strength of the progressive candidates. In other words, if you believe you’re the strongest progressive candidate, prove it with 1CalgaryCentre. This summer we approached the national leadership of each of the progressive political parties. We invited them to participate in a process to select a consensus progressive candidate in Calgary Centre. For the most part, the parties were not interested in engaging with us. They went forward and nominated candidates. We then turned our attention to working with the local campaigns. The progressive parties have nominated three impressive candidates: conservationist Harvey Locke for the Liberals; sustainability author Chris Turner for the Greens; and poverty reduction advocate Dan Meades for the NDP. Any of these candidates would work hard to promote progressive policies if elected as MP for Calgary Centre. Since August 2012, 1CalgaryCentre has engaged progressives through social media, online forums and an “unconference”. We are reaching over 37,000 people through our social media channels. Stories about 1Calgary centre have appeared in the Globe and Mail, FFWD, Huffington Post and most other media covering the by-election. Our video got the internet excited about the CBC. 1CalgaryCentre has proposed a progressive primary—an online vote to be held on November 22nd. Why hold a vote? To give progressives a clear signal of who has the best chance of winning the by-election on November 26th. 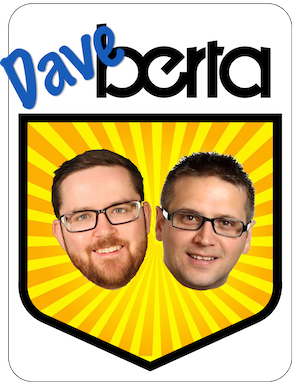 What if my candidate doesn’t win the 1CalgaryCentre vote? The candidates and voters are free to decide what their next steps after the 1CalgaryCentre process. Why don’t progressives just get behind my candidate, as they have the best chance of winning? I’ve heard this message from all of the progressive parties. My response: prove it. If your candidate is able to take on a 40-year conservative dynasty in Calgary Centre, they should be able to establish that they have more support than the other progressive candidates in an online vote. Isn’t an online vote susceptible to tampering? Political parties regularly use online voting for their leadership elections. 1CalgaryCentre is using a combination of high-tech and hands-on tools to ensure the integrity of our process. Every registration is reviewed by at least two people. I heard that 1CalgaryCentre is really a front for party X? 1CalgaryCentre is a registered third party with Elections Canada. Pursuant to the Canada Elections Act political parties cannot register as third parties. Our volunteers have been completely transparent about their diverse interests and backgrounds—one even revealed that he once cooked dinner for Jack Layton and Olivia Chow. Disclosure! 1CalgaryCentre may or may not achieve its goal of electing a progressive MP on November 26th. However, we have helped people believe that electing a progressive MP in Calgary Centre is possible. The polls show this. Social media shows this. Mainstream media admits that the Conservatives could lose in a historic upset. We don’t believe that doing the same thing over and over again in Calgary Centre elections and expecting different results makes sense. We won’t subscribe to the narcissism of small differences between the progressive parties. Instead, register with 1CalgaryCentre to try something new on November 22. We just might make history in Calgary Centre. Again. Jeremy Barretto is an environmental lawyer and long time Calgary Centre resident. He is a member of the 1CalgaryCentre team. This entry was posted in Alberta Politics and tagged Eric Lowther, Jeremy Barretto, Joan Crockatt, Joe Clark, Kent Hehr, Lee Richardson, Naheed Nenshi on November 20, 2012 by Dave Cournoyer. IT’S A RACE! New poll shows emerging three-way race in Calgary-Centre by-election. Calgary-Centre By-Election candidates Joan Crockatt, Harvey Locke, and Chris Turner. A new survey conducted by Forum Research shows a three-way race in the Calgary-Centre by-election between Conservative Joan Crockatt, Liberal Harvey Locke, and Green Chris Turner. As reported by the Globe & Mail, the November survey of 376 randomly selected residents in Calgary-Centre showed Ms. Crockatt with 32% to 30% for Mr. Locke and 23% for Mr. Turner. New Democrat Dan Meades was in fourth place with 12%. The survey is considered to be accurate by plus or minus five percentage points, 19 times out of 20. If this new survey is to be believed, then the November 26 vote could be much more exciting than most political watchers, including myself, had previously predicted. A similar survey conducted by Forum Research in October found Ms. Crockatt with 48% to 28% for Mr. Locke, 11% for Mr. Turner, and 8% for Mr. Meades. Another survey from Forum Research conducted in August found the Conservatives with 44% to 21% for the Liberals, 14% for the NDP, and 12% for the Greens. It appears that within a matter of months, the 40% margin of victory earned by former Conservative MP Lee Richardson in the 2011 federal election and 23% margin for the Conservatives found in the September survey may have completely evaporated. It is always important to approach surveys, like this interactive voice response (IVR) survey, with a healthy dose of skepticism. Survey results are a snapshot of the opinions of a surveyed group of individuals at a given moment in time. This said, surveys like this one can be an important indicator of trends. A close race could increase the importance of the 1CalgaryCentre campaign if progressive voters see an opportunity to coalesce behind one of the main opposition candidates. Although 1CalgaryCentre was initially ignored and ridiculed by the campaigns, it has played a central role in the debate around vote-splitting in the riding. On November 22, the group will hold its “selection vote” which allows voters in Calgary-Centre to register and select their choice from the progressive candidates running in the by-election. Harvey Locke and Bob Rae. As this contest enters its final two weeks, Ms. Crockatt’s two main opponents have taken aim at their mutual opponent and each other. 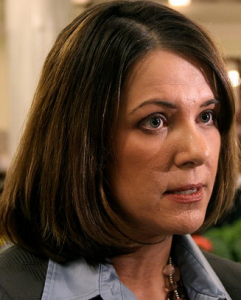 Ms. Crockatt’s tacit support of the Wildrose Party in the spring provincial election appears to have driven a number of moderate Tories away from her campaign in the downtown Calgary riding. Her campaign manager, William McBeath, is the Wildrose Party’s Political Operations and Communications Director. Mr. Turner’s campaign has criticized Mr. Locke for not living in the riding (he lives in Banff) and Mr. Locke’s campaign has accused Mr. Turner of splitting the anti-conservative vote in the riding. All campaigns have made use of social media, Mr. Locke’s campaign recently launched a Tumblr for Calgarians to show their support for his campaign. While Ms. Crockatt’s and Mr. Locke’s campaigns have mainly focused on the tried and true strategy of doorknocking, Mr. Turner has incorporated some tactical and guerrilla style techniques into his campaign, which has helped create an air of excitement around the Green Party candidate (Mr. Turner has been seen delivering flash speeches on Calgary transit buses and holding numerous intimate coffee and wine and cheese parties). Calgary-Glenmore PC MLA Linda Johnson (left) stopped by Chris Turner’s (right) campaign office to visit her daughter (centre), who is volunteering on the Green campaign (Photo by @rottonchild on Instagram). Outgoing Liberal leader Bob Rae campaigned with Mr. Locke today and leadership candidate Justin Trudeau is making a second appearance in Calgary-Centre on November 19. 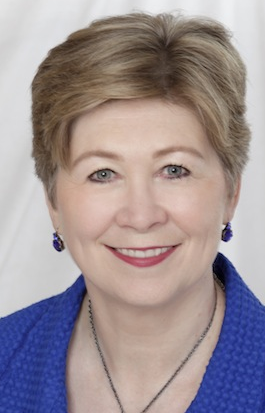 Former Ontario MP Martha Hall Findlay is expected to used Calgary as her launch pad into the Liberal leadership campaign. Mr. Turner has benefited from the support of key organizers from Mayor Naheed Nenshi‘s 2010 election campaign. On November 17, Green Party leader Elizabeth May and famous environmentalist David Suzuki will be attending a “Turning Point” rally at Scarboro United Church in support of Mr. Turner’s candidacy. Mr. Turner was event pictured in a photo online with Calgary-Glenmore PC MLA Linda Johnson, whose daughter is volunteering with the Green Party campaign. Meanwhile, NDP leader Thomas Mulcair made an appearance at a packed rally tonight to support Mr. Meades campaign in Calgary-Centre. Mr. Meades, the director of Vibrant Communities Calgary, was also joined on the campaign trail by Edmonton-Calder MLA David Eggen last week. This entry was posted in Alberta Politics and tagged Blake Richards, Bob Rae, Chris Turner, Dan Meades, David Eggen, David Suzuki, Elizabeth May, Harvey Locke, Jason Kenney, Joan Crockatt, Justin Trudeau, Lee Richardson, Linda Johnson, Martha Hall Findlay, Michelle Rempel, Naheed Nenshi, Thomas Mulcair on November 13, 2012 by Dave Cournoyer. “transparency” is hard when your party has been in power for 41 years. 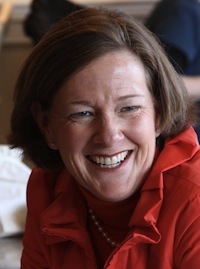 Surrounded by dozens of Tory MLAs at a late-afternoon press conference, Premier Alison Redford announced plans to make the expense claims of all cabinet ministers, MLAs, and government officials publicly available on the internet. After a summer of scandals and embarrassing revelations, ranging from the overflowing expense accounts of former regional health authority executive Allaudin Merali and current University of Calgary board chairman Doug Black, the suspicious hiring of former cabinet minister Evan Berger, and the cancellation of funding to a long-promised police college in Fort Macleod, Alberta Tories must be desperately thirsty for anything that could be cast as a good news story. The new rules place limits on the purchase of business class airline tickets and a ban on expensing alcohol. What format the expense disclosures will be made available online is still unknown. As I wrote about last month, not all online transparency is created equally (or accessibly). As has also been pointed out by political reporters online, the new rules are unclear if there will be sanctions for employees who break the new expense rules. It is also unclear if the rationale behind any special exemptions, made by the Treasury Board, will be made public. Yesterday’s burst of transparency comes one week after Premier Redford and Finance Minister Doug Horner were widely criticized for only not releasing the full data from the quarterly provincial fiscal update which predicted a potential $3 billion deficit. Earlier in the summer, it was announced that Elections Alberta investigations into illegal donations to the Progressive Conservative Party would also remain secret. Perhaps trying to create a positive defining narrative for Premier Redford’s government, which has been largely absent since the April 2012 election, Ontario-based public relations and issues management expert Stefan Baranski has been tapped to work with the Premier. A Principal with Counsel Public Affairs, Mr. Baranski founded ontarionewswatch.com and served as senior advisor to PC leaders Tim Hudak and John Tory, and Premier Ernie Eves. In 2010, he served a Director of Communications and chief spokesperson for Toronto mayoral candidate George Smitherman. Earlier this year, Calgary-Centre Conservative Member of Parliament Lee Richardson left Ottawa to join Premier Redford’s staff as her Principal Secretary. I am told that long-time Tory and Volunteer Alberta executive director Karen Lynch recently joined Premier Redford’s staff as her director of tours and schedules. This entry was posted in Alberta Politics and tagged Alison Redford, Allaudin Merali, Doug Black, Doug Horner, Ernie Eves, Evan Berger, George Smitherman, John Tory, Karen Lynch, Lee Richardson, Stepgen Baranski, Tim Hudak on September 6, 2012 by Dave Cournoyer. calgary-centre by-election nominations take a strange turn. The Calgary-Centre Conservative Party nomination contest took a turn for the strange over the past few weeks. Originally shaping up to be a three-candidate contest, Alderman John Mar and former Canadian Taxpayers’ Federation chairman Andy Crooks dropped out of the race earlier this summer, leaving political commentator Joan Crockatt as the lone survivor of the original three candidates in the nomination contest. Video store owner, former Alderman and Progressive Conservative MLA Jon Lord is one of the new candidates to enter the contest. 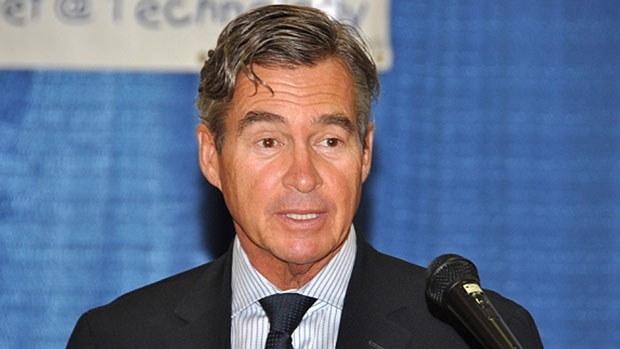 Mr. Lord placed a distant sixth in his bid to become Mayor of Calgary in 2010 and was unsuccessful in his attempt to win back the PC nomination in Calgary-Currie before the recent provincial election. In the 2004 provincial election, Mr. Lord was unseated as MLA by Liberal Dave Taylor. Lawyer Rick Billington has also joined the contest. Mr. Billington is a long-time Conservative Party director in the neighbouring riding of Calgary-Southwest. 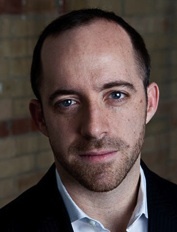 His website biography lists him as having participated in the Leaders Debate preparation team for Premier Alison Redford during the 2012 Alberta election. Also running are Stefan Spargo, who was former MP Lee Richardson‘s campaign manager and also made an unsuccessful bid for the PC nomination in Calgary-Currie, and past Conservative riding president Greg McLean, who entered the contest last week. 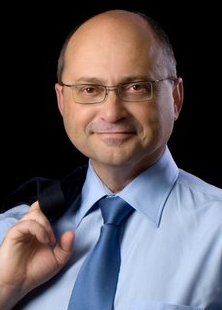 Perhaps the strangest candidate to join the Conservative nomination contest is Quebec political advisor and Ottawa-area resident Joe Soares – who describes himself as “Calgary Joe.” It is not known whether Mr. Soares has spent any significant amount of time in Calgary or has any connection to the city or the province of Alberta. The messaging on Mr. Soares’ website is a textbook case of negative partisanship, taking aim at New Democratic Party leader Thomas Mulcair, who he accuses of wanting to destroy Alberta’s economy. The political insider also takes aim at the perceived frontrunner Ms. Crockatt, who he accuses of defending former Ontario Conservative MP Belinda Stronach when she crossed the floor to the Liberal Party in 2005 (which I imagine is a top of mind issue for Conservative Party members in Calgary-Centre). The date of the Conservative nomination vote has not yet been set, though the deadline to enter the contest occurred last week. Despite rumours that popular Calgary-Mountain View MLA David Swann might enter the Liberal Party nomination contest (or the NDP contest), only two candidates will be on the ballot at the vote on September 15, 2012. Lawyer and former Canadian Parks and Wilderness Association President Harvey Locke and educator Rahim Sajan. Past candidate William Hamilton has already declared his interest in running for the Green Party and author Chris Turner told the Calgary Herald that he is considering seeking the nomination. Their status as Official Opposition in Ottawa does not seem to have generated wide interest in the NDP nomination. I have heard very little about who the NDP candidate in this by-election could be. However unlikely, the latest speculation I have heard is that some party members are trying to draft Anne McGrath to carry her party’s banner in the downtown Calgary riding. Ms. McGrath is the former President of the NDP and chief of staff to former NDP leader Jack Layton. She ran for the provincial NDP in the Calgary-McCall by-election in 1995. The newly created Online Party of Canada has attained registered status with Elections Canada just in time to nominate a candidate to run in the Calgary-Centre by-election. This entry was posted in Alberta Politics and tagged Alison Redford, Andy Crooks, Anne McGrath, Belinda Stronach, Chris Turner, Dave Taylor, Greg McLean, Harvey Locke, Jack Layton, Joan Crockatt, Joe Soares, John Mar, Jon Lord, Lee Richardson, Rahim Sajan, Rick Billington, Stefan Spargo, Thomas Mulcair, William Hamilton on August 6, 2012 by Dave Cournoyer. nathan cullen aims to unite progressives in calgary-centre. 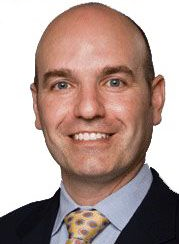 Skeena-Bulkley Valley New Democrat Member of Parliament Nathan Cullen is jumping into Calgary’s Stampede celebrations next week to host a workshop on uniting progressives in advance of the inevitable by-election in Calgary-Centre. In 2011, the NDP orange wave made more of a ripple than a splash in Calgary-Centre. Parachute candidate Donna Montgomery earned only 14% of the vote, up from 9% in 2008. It is difficult to imagine any candidate other than a Conservative will win the expected by-election, but it is interesting to see that the NDP are putting some energy into cultivating and engaging potential supporters in this downtown Calgary riding. Representing the northern British Columbia federal riding through which the proposed Enbridge Northern Gateway Pipeline will travel, Mr. Cullen has been a vocal critic of the development that would export crude oil and bitumen from the Athabasca oil sands to a marine terminal in Kitimat, BC. The NDP launched a spoof website last week in response to claims by Conservative politicians that “radicals” are holding up the public hearing process. Calgary-Centre Conservative MP Lee Richardson announced his resignation on May 30, 2012 after accepting a job offer to become Principal Secretary to Premier Alison Redford. Mr. Richardson was first elected in this riding in 2004 and was re-elected with 57% of the vote in May 2011. Conservatives Joan Crockatt and Alderman John Mar have announced their bids to seek their party’s nomination. Beena Ashar is the lone candidate seeking the Liberal nomination and past candidate William Hamilton is seeking the Green Party nomination. This entry was posted in Alberta Politics and tagged Alison Redford, Beena Ashar, Donna Montgomery, Joan Crockatt, John Mar, Lee Richardson, Nathan Cullen, Rachel Notley, Stephen Harper, William Hamilton on July 5, 2012 by Dave Cournoyer.